Even if knew how to build flight-capable cars, we’d run into a whole new set of other problems, such as training people to use them and creating a whole new set of laws and infrastructure to accommodate them. Still, that hasn’t stopped Toyota from dreaming and teasing us about it. In December 2014, the automaker filed a patent for an “aerocar” with the US Patent and Trademark Office, which featured stackable wings. Maintenance Tip: When is it time to change your brakes? 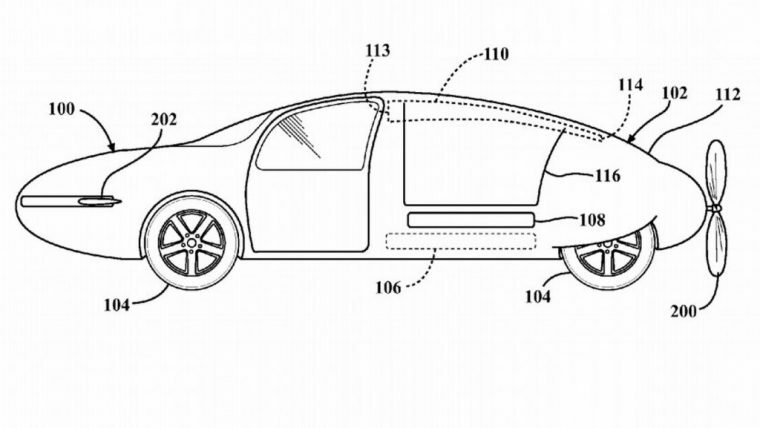 Now Toyota has filed yet another patent, this time for a car that has a teardrop shape, a propeller at the back, wings that pop out and provide roll control, and the same kinds of canards ahead of the front axle that you might find on a Eurofighter Typhoon, which provide pitch control. The most interesting thing about it is how Toyota is tackling the wings. Instead of folding them onto the body for road driving, which is what Terrafugia has been doing, it is keeping them hidden behind the body panels. We doubt we’ll see a flying Toyota Camry any time soon, but the fact that Toyota is wiling to file a patent still suggests that the Japanese automaker is thinking about this seriously… maybe. Building a flying car is a long process, after all, and the technology developed along the way could very well have applications on the road-bound models we have now.